Abstract: The Vortex Plus heatsink stands 83mm tall, in total. A 25mm thick, 92mm PWM fan exhausts downward so waste air impinges on a lower extruded aluminum heatsink that sits atop the processor. It's both a good use of space for additional cooling surface area and an admission by heatsink designers that the aluminum fins above aren't getting the whole job done by themselves. Coolermaster is back in the game with novel lower-profile heatsink called the Vortex Plus. 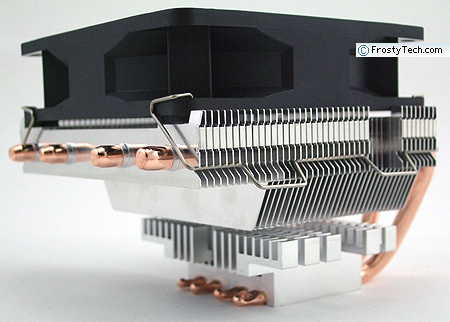 It's an exposed heatpipe base cooler, with four 6mm diameter copper heatpipes supporting an array of horizontally aligned thin aluminum fins. It's a design approach that can have mixed results if the fabrication is not handled carefully. A cracked wick structure in the heatpipes from a 180 degree bend can render the thermal solution ineffective at higher heat loads, for example. But that's a worst case scenario reserved for another heatsink, Frostytech's tests of the Coolermaster Vortex Plus show it to be a good all around cooler on both Intel and AMD platforms when its 92mm fan is spinning away at stock speed. In any event, exhaust air from Coolermaster's Vortex Plus continues to do some useful work by cooling adjacent motherboard components. Many motherboard makers place extensive passive heatsinks on these CPU power MOSFET's, which in turn have a parasitic relationship with the CPU heatsink for cooling airflow. Weighing in at 445 grams, the Coolermaster Vortex Plus heatsink stands 83mm tall and has a footprint of roughly 115mm x 100mm. The good bulk of it is elevated 41mm above the CPU for marginal clearance of nearby board mounted components. Coolermaster's Vortex Plus installs onto Intel socket LGA775/1156/1366 and AMD socket 754/939/940/AM2/AM3 processors. Materials: Aluminum fins, copper heatpipes, extruded aluminum base with exposed heatpipes. There are fewer and fewer lower profile heatsinks hitting the market for some reason, and this is leaving compact PC owners out in the rain when a new heatsink is needed for their tiny PC. We're happy to see Coolermaster making the effort to address this void in after market CPU thermal solutions. 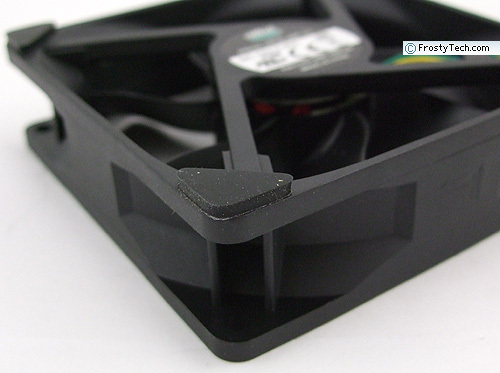 A 92mm PWM fan is held in place on the top of the Vortex Plus heatsink with two wire fan clips. To counteract an unbalanced impeller which can lead to vibration and rattling noises, small rubber patches are applied to the four corners of the fan. Coolermaster's Vortex Plus heatsink ships with brackets for Intel socket LGA775/1156/1366 and AMD socket 754/939/940/AM2/AM3 processors. The metal Intel brackets that accommodate sockets 775/1156/1366 motherboards use a multiple position system, with little plastic tabs that look like the standard Intel push-to-click plastic retention tabs, but operate differently. Once the metal brackets are installed on the board, a separate cam arm slots through the heatsink and is screwed into place. This part of the mounting bracket works well enough in the confined spaces it is intended for, but the plastic tabs which hold the metal brackets to the motherboard snap in half if you twist the tops to unlock them. Since they look just about the same, when it comes time to remove the Vortex Plus from the motherboard it's not hard to make the mistake of doing this, as you would the standard Intel push-to-click retention system. The heatsink is installed on AMD socket 754/939/940/AM2/AM3 processors via the standard AMD heatsink retention cage. 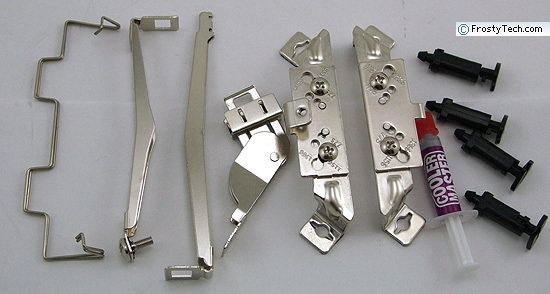 A metal cam-operated tool free bracket locks onto the tabs of the AMD retention bracket and applies the necessary force with a quick flip of the lever.